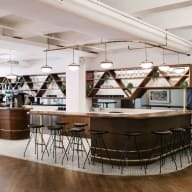 We are an upscale, boutique workspace in trendy NoMad, Manhattan. Designed to promote workplace fluidity and focus, we offer cultivated workshops, speaker series', lifestyle and wellness events customized for all members. We also are the perfect hub for special private events of different varieties. Perfect for: Product Launches / Company Off-sites / Panel Discussions / Seminars / Film Screenings / Location Photo Shoots / Social Events / Showcases / Tradeshows / Workshops This 3,000 sqft Nomad event and meeting space includes designer furniture and an upscale environment for entertaining. Big windows and lots of natural light as well as high ceilings help to add an open atmosphere makes for a non-traditional social or conference rental. The space is designed for a flexible event format, perfect for presentations into networking into breakout sessions. If you’re planning on offering catering and bar, we work exclusively with the best in the city and we have the wonderful trained staff, too. There is no outside catering/bar allowed. A big advantage of this space is undoubtedly its location. The venue is very well connected with subway stops only meters away (line 4 and 6). Close to: Empire State Building Grand Central Station Penn Station Herald Square As an additional service, we work with amazing hotels in the area to offer special rates for guests. Inquire with your representative! We're excited to get to know you and your needs to host an epic event! *Includes use of a projector, screen, microphone for speeches. An AV tech is required to run the logistics at $75 hourly (3 hour min). Various extras are available to be booked in addition. An on-site manager at $50 hourly and a door greeter at $30 are required for all events. Business hours from 9am-6pm are $1000/hr After 6pm on, rate is $750 hourly $350 Mandatory cleaning/trash removal fee $50 hourly on-site manager fee $30 door greeter fee Other costs associated: AV equipment food/beverage service staff We do not offer full day rates - venue fees are charged hourly. Please ask about furniture and AV capabilities.